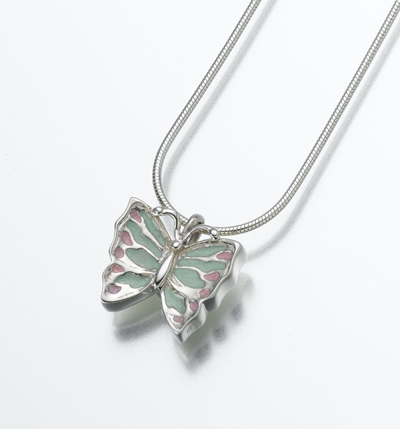 Hold your loved one close to your heart with the Butterfly Cremation Pendant. Made in the USA from sterling silver, the pendant allows for storage of a small portion of cremation ashes. The beautifully detailed butterfly, with enameled wings, is the Christian symbol for resurrection and provides a comforting remembrance to those grieving a loss. It can also be used to store other keepsakes such as dried ceremonial flowers, locks of hair, or burial soil.